A wrought iron wrench used for a dual purpose. One was to loosen or tighten the big nuts on wagon axles that held the wheels in place. The other was for pinning the Doubletree to the wagon Tongue, with the wrench handle being used as the pin. One advantage of such an arrangement was that the horses were automatically disconnected from the wagon before a wheel was intentionally removed. This had a rainproof, sloping, hinged and overhung lid where each wagoneer kept his wagon wrench and a 5-lb. 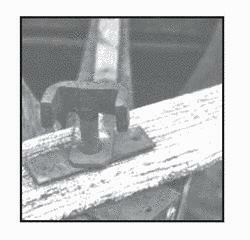 On most wagons the wagon wrench did double duty as a pin for the double tree, to which the wheeler team was hitched.